Acorn Hill 4-pc. Queen Bedroom Set Distinctive lines with a nod to mission style—the Acorn Hill 4-piece queen bedroom set blends classic craftsman elements with more traditional details. Reeding outlines drawer panels, and chamfered edges and clipped corners add further refinement. The robust character of oak veneers and pewter-finished hardware—and extras like cedar-lined drawers, dustproofed cases and a hidden felt-lined jewelry drawer—make this queen bedroom set hard to resist. Distinctive lines with a nod to mission style—the Acorn Hill 4-piece queen bedroom set blends classic craftsman elements with more traditional details. Reeding outlines drawer panels, and chamfered edges and clipped corners add further refinement. The robust character of oak veneers and pewter-finished hardware—and extras like cedar-lined drawers, dustproofed cases and a hidden felt-lined jewelry drawer—make this queen bedroom set hard to resist. L: 89.5" x W: 66.5" x H: 63.5"
Loved every single piece in this set. Very happy with the quality and style, rustic morden Classic I would call it. It is a bit bulky size wise if your bedroom is small with low ceiling.. For us it wasn't an issue as we have high ceilings. I would recommend it as it is an excellent value for the money. We only went shopping for a mattress and we fell in love with this set. Purchased the 4 piece set along with the chest and an extra night stand. The set is very solid and seems to be very sturdy. Not recommended for a small room. We have only had the set a few weeks, but I love it. We absolutely LOVE the new bedroom suite and it comes with lots of perks that we were not aware of initially - like one touch lights on the back of the night stands and a drawer that has a open hinged front for your DVD player! it’s a set, i love that the end table has outlets for electronic devices. it’s very convenient. Very happy with this set. The folks that delivered it said it was their favorite set from a quality point of view, but very heavy to move around. Drawers slide well in dresser, lots of nice features as previously mentioned. I can't say enough good things about the set. I am very happy with it so far! Love the mission/transitional style of the set. Very chunky & heavy & great color wood. We have had so many compliments! 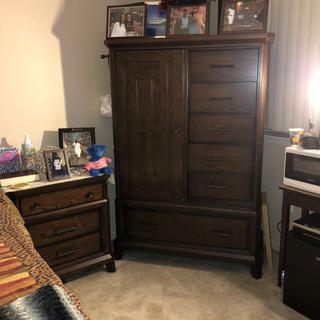 Loved the Armoire but was a tad too large for our bedroom especially because it was very high (wanted to place a TV on top) but the tall dresser (& its secret drawer) are a perfect fit! This Broyhill bedroom set, is absolutely beautiful, not only does it look lovely it is sturdy, well made, it isn’t veneer, I the drawers on the chest, dresser and night stand are large deep and wide but the wonderful feature is the drawers are on tracks, when I saw this set in showroom I liked it, when delivered and placed in my guest room it looks soo rich absolutely stunning, I’m so happy with this set, it’s beauty and richness , and the compliments I’ve received, make me know I made a great choice. The salesperson Amy was a delight very helpful no pressure, she helped tremendously. The delivery was wonderful, they came on time, they were fast clean and courteous, furniture came wrapped, not a scratch , not a chip not a bang. Five stars for service, I would recommend Raymour & Flanagan to anyone buying furniture, my experience was at the white plains store. Thank you Raymour & Flanagan. I LOVE,LOVE,LOVE my 4pc. Acorn Bedroom Set ... it’s Very Stylish. It looks much larger in the home than it looks in Th e showroom ... But it LOOKS MUCH BETTER IN THE HOME. .... I’m a very picky person and I’m EXTREMELY PLEASED with my purchase....I do wish the nightstand drawers were a little deeper but the 3rd (top drawer) is a plus.. I also purchased an additional nightstand which makes the set look even nicer. I’m very Happy ?? I love it and feel like a queen. great sturdy set that is very well built. Do I need box spring for the mattress or it will be too low? BEST ANSWER: The Acorn Hill Bed would require a box spring. would this set fit comfortably in a 12 x 14 room? 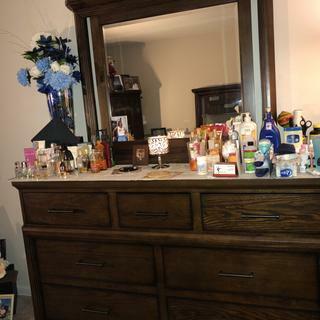 BEST ANSWER: I have the queen set w/ one nightstand, dresser and door chest in a 12 x 13 room. It'll fit, but you will be limited in your configuration options, with windows and closets adding to the challenge. It's tight but certainly doable, more so for you with that extra foot. Depends on how much wall space you have. Would probably be a little tight. We have a huge bedroom, so have 2 night stands and an additional dresser. We do however love the bedroom set. It is very well made. does the furniture have foot gliders on the feet for easy moving? BEST ANSWER: Each leg has a threaded "inner" foot that allows you to unscrew it out, sort of like a washing machine foot. Difference here is that when the foot is fully threaded up, it's level to the wooden leg leaving a flat bottom. The foot is between 1/2 and 3/4" in diameter and made of a hard plastic, but as far as whether it's a "glider", I can't say. I used mine to level the bed and chest, being both were half on an area rug and half on hardwood. What is the height from the floor to the top of the side rail? 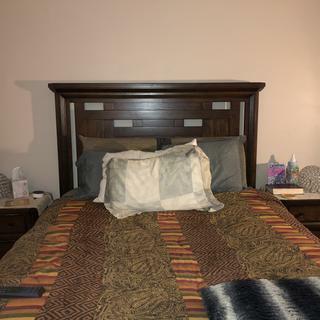 what height mattress works with acorn hill headboard? BEST ANSWER: The height of the mattress is a personal preference, as the Acorn Hill can accommodate any height of mattress. How much space is there under the bed frame ? Can you get storage trays under or? BEST ANSWER: The space from the floor to the bottom of the side rail measures 6". 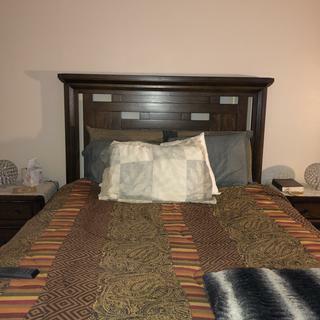 Can you tell me if any other headboard you offer might match this set? BEST ANSWER: While Raymour & Furniture does have headboards that would coordinate with the Acorn Hill collection, it would not be a precise match to the finish. What are the underneath supports for this Queen bed? Is it a cross slat system (with only 3 or 4 slats) or are there multiple slats that run all the length of the bed? BEST ANSWER: The Acorn Hill bed is supported by a slat system, consisting of 5 slats that screw to the frame.